In early 2007, Nintendo of Japan released a Club Nintendo-exclusive game called Tingle's Balloon Fight. It's basically a re-skinned version of one of the company's classic Famicom/NES titles--starring that odd Legend of Zelda character, Tingle, rather than the nameless, titular "Balloon Fighters" of the original, of course. I played a bit of Tingle's Balloon Fight while on vacation last week. The experience took my mind to some crazy places. 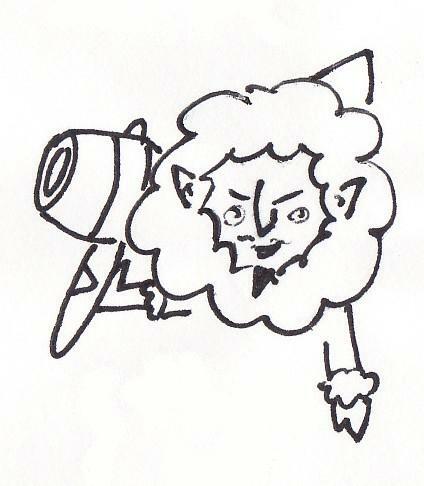 Case in point: The following doodle--of Tingle in Ice Climber drag. Two similar drawings can be seen in my deviantart gallery and in my Flickr photostream. Wouldn't it be cool if Nintendo released a bunch of these re-imaginings? Along with a Tingle's Ice Climber, they could make a Tingle's Wrecking Crew, for instance, or even a Super Tingle Bros. Hmm, I think I now know the subject of my next few doodles. Super Tingle Bros. would be hilarious! He could collect rupees while he pranced through each stage, tromping even the foes Mario couldn't best. A super mushroom could make him macho and a fire flower would give him stylish flames on his jumpsuit and the ability to throw flaming balls of...something...at foes.